Looking for some very tasty dried fruits that are 100% and additive free? Jackfruit, Mango, Pineapple, Cranberries & Trail Mix . You want to taste our most favored foods? You love dried fruit, nuts and seeds? 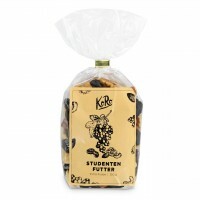 Then you have to check out our Starter-Set with KoRos Best: Jackfruit, Mango, Pineapple, Cranberries and our Trail Mix. You want to taste our quality? Those exotic fruits look appealing but you don't want to buy a single product? Then this should be right up your alley: Our Starter-Set Exotic with dried Jack Fruit, Mango and Pineapple. Even though we specialise in best quality food in big quantities we want you to have the chance to try out with these smaller 250 g packs. Now you can decide what exotic fruit is the best option for you. May contain traces of GLUTEN, SOY, NUTS, ALMONDS, PEANUTS, MILK (LACTOSE), SESAME and SULPHIDE (SULPHITE). What is the KoRo Starter Set? The KoRo Starter set contains a few of the most popular products of KoRo and is the best way for newbies to get to know KoRo's products. Ein schönes Paket um das Sortiment zu probieren. Ich fand alles lecker außer die Jackfrucht. Hier kann man nichts falsch machen, hervorragende Qualität. Leckere Auswahl an Trockenfrüchten. Perfekt für das Müsli. Super Qualität. Hätte echt nicht gedacht, wie unterschiedlich getrocknete Mangos schmecken. Echt lecker! Mein Highlight des Pakets ist die Mango. Der Hammer! Kein Vergleich zu Trockenobst aus dem Supermarkt.